Multiple Grade I winner and the richest New York-bred in history Mind Your Biscuits arrived at Churchill Downs early Thursday morning to begin training towards the $200,000 Lukas Classic (Grade III) on Sept. 29, a race that trainer Chad Summers hopes catapults the 5-year-old horse to a Breeders' Cup victory. “You obviously can't take anything away from Diversify, he's a very nice horse,” Summers said. “Dealing with six other owners is a lot of stress on deciding where to run but I'd love to match up against him again in the Breeders' Cup Classic. I would've loved to match up against Justify with this horse, too, but that won't happen. He's just a superstar. Mind Your Biscuits competed in the last two runnings of the TwinSpires Breeders' Cup Sprint (GI) and finished second and third, respectively. 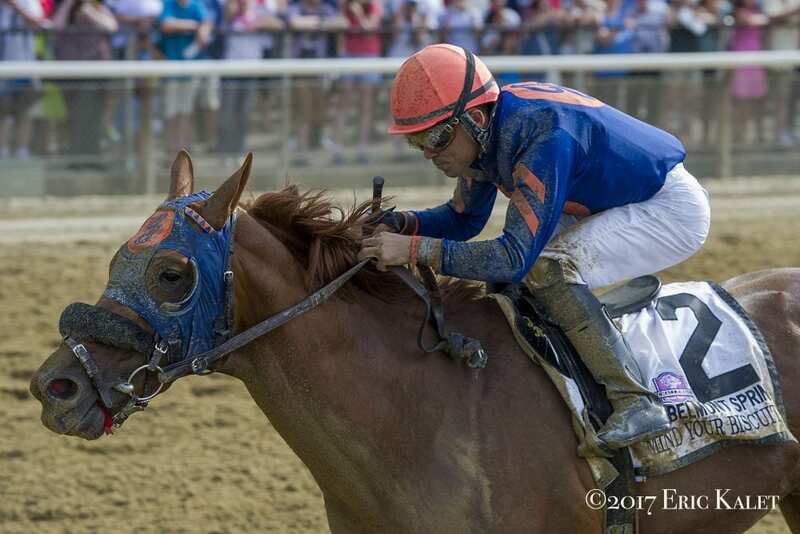 Owned by Summers along with partners Shadai Farm, J Stables, Head of Plains Partners, Scott Summers, DanielSummers and Michael Kisber, Mind Your Biscuits sports a record of seven wins, 10 seconds and three thirds from 23 starts with earnings of $4,159,286. This entry was posted in Breeders' Cup and tagged Breeders' Cup, breeders' cup classic, chad summers, churchill downs, mind your biscuits by Press Release. Bookmark the permalink.